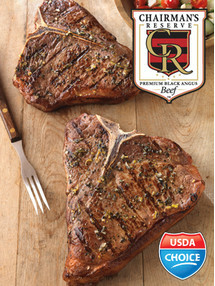 Have you ever tried our Chairman's Reserve Premium Black Angus Beef? If you haven't, you're missing the best beef there is . . .
• the Highest USDA Graded Beef - Top 12%! Stop by our meat department to experience Chairman's Reserve Black Angus Beef today! Interested in learning more about Chairman's Reserve Black Angus Beef? Download more information from our Links Page.